Incidents of indoor air pollution have increased lately due to our “air-tight” modern construction practices. What was once perceived as an energy saving feature has now revealed its ugly side-lack of air infiltration results in the recirculation of the same old air, causing increased pollution concentrations inside the home. Polluted indoor air at home and at work has been blamed for increasing cases of respiratory ailments, from asthma to allergies. Even such complaints as chronic fatigue, often dismissed as psychological, are possibly the product of unhealthy air. A human breathes about 50 gallons of air every day. Air is invisible because the molecules that comprise it are too small to reflect light. We “see” air only when it carries airborne particles, since even the smallest suspended particles, such as those that make up cigarette smoke, are thousands of times bigger than the nitrogen, oxygen, carbon dioxide and water vapor molecules that make up air. There are thousands of possible pollutants: formaldehyde from carpets, drapes and particle board; asbestos lurking in most homes older than 20 years–tucked away in pipe insulation, acoustical materials and floor tiles; and the most common source: molds and mildew. Molds and mildew are fungi that can grow on a surface containing any amount of organic material, which includes almost all building materials. 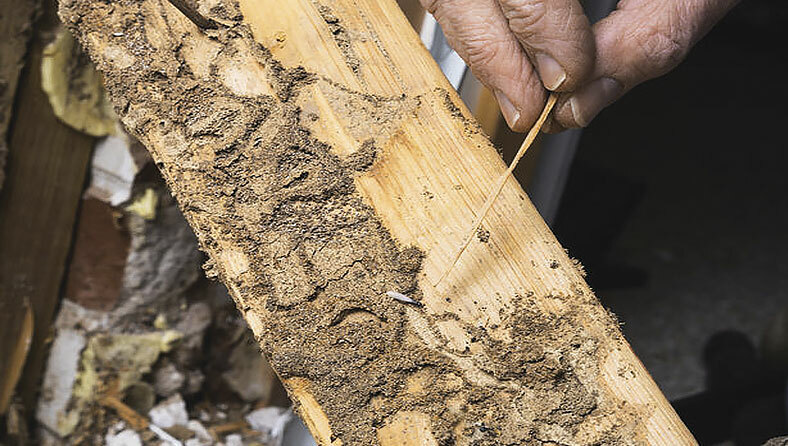 Though some fungi, such as mildew, do no direct damage to building materials, their presence is an indication of a high moisture condition that can nurture other fungi, including wood rot. In humans, allergy is the most common symptom associated with exposure to elevated levels of fungi since most fungi produce antigenic proteins that can trigger allergic reaction in allergy-sensitive people. Molds also give off spores, which, combined with other common household particles such as pollens and pet dander, settle out as dust. Molds grow at temperatures above 40° and below 100°. They do not need the presence of standing water. High relative humidity or the build up of moisture on building surfaces will do. The danger of mold growth is greatest on building materials that have gotten wet, since most have the tendency to absorb and retain moisture. Water leaks that have been present long enough to wet surrounding materials provide productive spawning grounds for molds and their spores. Another hot bed for mold is the sub-flooring above a damp crawl space. A polyurethane moisture barrier should cover the entire ground surface and fresh air should circulate freely throughout the crawl space. Keep rooms clean and dry. Good ventilation is vital to keep mold colonies from flourishing. Pay special attention to bathrooms, kitchens, basements and crawl spaces, areas that are normally exposed to high humidity. Clean any moldy surface with a disinfectant, such as chlorine bleach. If any furniture or carpet gets wet, it must be dried thoroughly or discarded. Humidifiers, dehumidifiers, and air conditioning condensing units can promote mold growth and spore-filled air. They should be cleaned regularly with a disinfectant. Central heat and air units can work against a clean indoor environment by circulating the same contaminated air throughout the home plus pulling dust from the ducts into the home. Make sure all filters are changed regularly and often. It’s a good idea to have your ducts professionally cleaned. Such cleaning employs a 200 psi (pounds per square inch) jet nozzle that shoots air into one end of the duct while a powerful vacuum pulls on the other end. The push-pull method is fairly standard among duct cleaners. Some offer brushing and post vacuum sanitation. The cost depends on the size of the home, and is usually priced per vent-prices range from about $20 to $50 per vent for the works. Another effect of household dust is that it serves as home for dust mites, microscopic, eight-legged creatures who live in dust. When dust becomes airborne the mites spread and form new colonies. They live on mold spores and human skin scales. They are generally found on fabric, such as sheets and furniture coverings, duct work, and mattresses. Most mattresses are crawling with dust mites. Carpets that are infested should be removed. Repeated washing can increase the levels of mold and mites. Covering instead of chemicals is recommended for dust mite infestations because the protein that triggers allergic reactions is in the mite’s skin, so the inhaled mite does its damage, living or dead. And spraying pesticides inside your home deteriorates the air quality even further. But if you must wage chemical warfare, Acarosan is sold for dust mite elimination, but it’s not labeled for use on bedding. Since dust mites are so widespread and might seem overwhelming, many people choose to ignore them. But if asthma attacks are increasing in your home, you should consider doing something about household mold, dust and mites. Wash sheets in very hot water. Heat and dryness are hostile to mites.